All efforts in our everyday lives are directed towards fulfilling an incessant flow of demands. Meeting life’s expectations fuels our sense of accomplishment. But more often than not, our worldly experiences – however trifling or significant – tend to entangle us into a spiral of chaos and fatigue, all the while setting off feelings of entrapment. When caught in that spiral, it is important to pause and notice that Nature always has a way of gently hinting at us, of quietly nudging us, of subtly teaching us important lessons by way of examples. 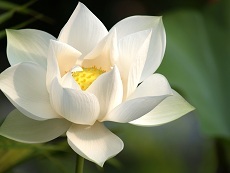 One such example is the lotus flower. The lotus flower takes birth in the muddy waters of a lotus pond. While its roots take hold deep into the mud, its stem grows higher and higher in its journey towards air and light. Once above the surface of the pond, the lotus bud eventually bursts into full bloom. The bloom of the lotus flower stands tall and beautiful, above the muddy waters of the pond, basking in glorious sunshine and unscathed by the filth and dirt around it. Like the lotus flower, we as human beings also take birth in a world encompassed by ego-driven grossness. We do our best to survive and flourish in worldly circumstances that are riddled with complex experiences that can easily blemish our spirit. Yet – just as the lotus flower, we too can rise above it all and remain pure and untouched. The way to remain unblemished by worldly experiences is to detach yourself inwardly from the disarray of your outward environment and turn towards the stillness within your heart. It is to conduct worldly matters with a sense of duty, without being attached to outcomes of credit, gain, or validation. It is to develop fortitude towards outward chaos while fueling the belief deep within your heart that all things happen for good – regardless of outcome. It is to recognize that the true source of your support, guidance, and worth resides within the innermost core of your heart and nowhere else. And it is to develop ultimate trust in that purifying essence of divinity that nurtures the stillness within. Let us strive to be like a lotus flower. When confronted with chaos, let us choose to not allow the gross complexities of our worldly lives soil our spirit. Let’s choose, instead, to remain untouched and rise above it all. Let’s aim at going higher and higher in our journey towards light, only to bask in the divine essence that pervades our hearts – and let that stillness within be the ultimate source of our sustenance.